At a predominantly white Ivy League college, a diverse group of students navigate various forms of racial discrimination and prove that the college is not as "post-racial" as it thinks. 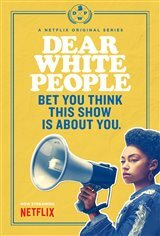 Sam White (Logan Browning) is the host of a popular, albeit controversial, campus radio show titled "Dear White People." Her radio show is a platform for Sam’s grievances, questions, and the racial and cultural issues that surface on ethnically diverse college campuses around the world. It also serves as the show’s anchor point, introducing each episode’s message and plotline.